It happens about this time each year…I begin the slow transformation into Frantic-Crazy-Christmas Mom. Armed with my long list of must-do, have-to-do, and want-to-do items, I hit the ground running on December 1. My transformation escalates as Christmas parties, obligations, shopping excursions, baking, wrapping, and travel fill the calendar. By the time December 25 rolls around, I’ve gone from Buddy the Elf to Mrs. Scrooge in a mere 3 1/2 weeks. Last year was the first time in a long time that didn’t happen. I was finishing up six rounds of chemotherapy, so I determined to focus on my health and my family and not worry about the rest of it. It was one of the most relaxed, enjoyable Christmases I can remember. But if there’s one thing I’ve learned in our journey over the last 14 months, it’s to focus on the truly important things. There’s nothing wrong with Christmas parties and homemade gifts, but when my time and energy are consumed with accomplishing my to-do list, there’s no time or energy left for what really matters…people. That’s when it’s time to kick the crazy to the curb! 1. Make a plan. We sat down as a family a few weeks ago and made a plan for our holiday season. We asked the kids their favorite traditions–foods, activities, events, etc. Then we scheduled those on the calendar; the rest are optional. We even gained an entire evening in December when we discovered an event we were all OK skipping! 2. Create time for family. We just completed a marathon trip for Thanksgiving–3 destinations and 19 hours in the van over 5 days. Why? Because we saw more family in those five days than we’ve seen all year. Yes, it was exhausting, but we’d do it all again in a heartbeat. If we wait to find time for family, we never will; we have to be intentional to create time for them. I’m confident our kids understand Christmas is about Jesus, not about gifts and stockings. But this year, we wanted to be intentional about giving to and doing for others. We found opportunities through organizations like Operation Christmas Child as well as making special gifts for individuals in our lives. 4. Find silence. My favorite spot in the month of December is in front of the fire place with the Christmas lights on. I’ll wake up early and curl up on the couch with a blanket and a cup of coffee. Then I simply sit and bask in the silence. Sometimes it’s only 10 minutes before all my creatures start stirring, but those 10 minutes of calm will give me enough sanity to make it through the day! 5. Remember Jesus. That seems so simple, really–almost trite. Of course, we know Christmas is about Baby Jesus in the manger, but too often we stop there. We forget that Baby grew up–then gave up His life for us. Too many times we forget that part until Easter. But that’s what Christmas is really about…it’s more than the fact that Jesus came, it’s why He came. He came because God loves us so much that He could not leave us where we were. He loves us so much He wants a relationship with us, and that could only happen through Jesus. You don’t need more things to do this Christmas. But if you’ll take a few minutes each day to focus on God and thank Him for Christmas, it will go a long way in keeping the crazy out! When my time and energy are consumed by my to-do list, there’s nothing left for what really matters. How do you stay focused and keep the crazy out during the holiday season? Thank the LORD you were able to visit family during Thanksgiving. Too much commercialism and not enough about the real reason people should be celebrating. Even though HE wasn’t born in the winter that has been set aside to celebrate HIS birth. Yes, it was eye-opening to realize some of the things I was stressing over to make every year “perfect” were things everyone else didn’t necessarily care about! I can’t stand all the stress of Black Friday, the emails, ads, etc all to cause panic about getting the best deal instead of buying the right gift. I love picking out the perfect gifts for my family, so when it becomes stressful instead of joyful, I know I need to refocus and relax. Lovely post, thanks for the reminder. We’re on the same wavelength! 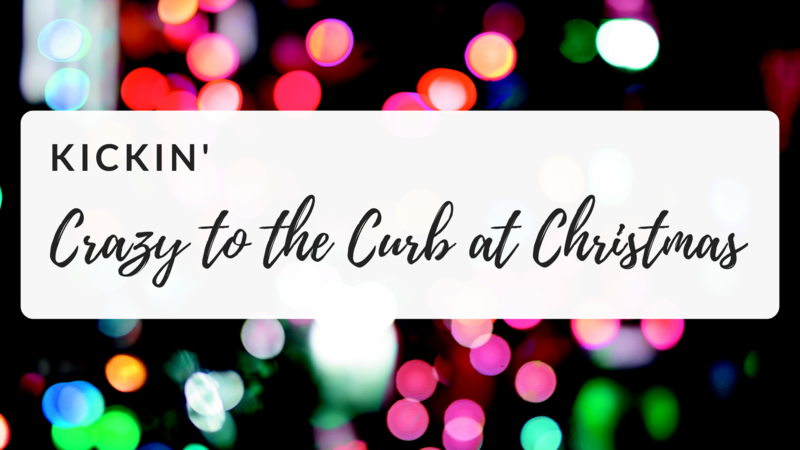 The holidays are so much more enjoyable when you let go of all the preconceived notions of how it is supposed to be and center it on Christ, family and helping others. Thanks for the great reminders! I stumbled upon your blog through the Fellowship Friday linkup.